Well hello friends and faithful readers. Sorry for the absence as of late. I wish I had some great excuse, but in all honesty, I have just been zapped of any desire to write. I've had plenty of time on my hands but my decisiveness, even in regards to a blog post, has been non-existent. But today I thought I'd share a little something I've been meaning to share for months--how we announced our pregnancy, well at least the creative ways. Most of our close friends and family live hours away so the whole "telling them in person" thing wasn't really an option for my impatient self (Jon was still in Afghanistan for another month). However, I was lucky enough to have one of my best friends, Bekah, coming down for a visit a few days after I found out. I thought it would be the perfect chance to have one creative thought come to life. 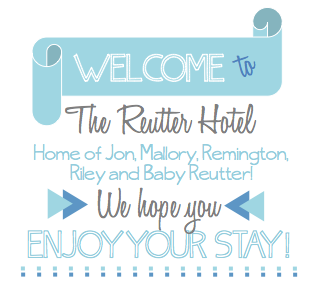 I decided to design a hotel-esque welcome sign for the guest bed listing all who lived at The Reutter Hotel, including our new baby :) Here's a close-up of the design. You can purchase your own here. I had the tent card all set up and ready to go before Bekah arrived. The funny part is that when I went out to greet her, she handed me a bottle of wine as a hostess gift. I said "thank you" and raved about it a bit in hopes that I wouldn't give myself away before she even made it to her room. How ironic that her sweet hostess gift was a bottle of wine, something I wouldn't get to taste for nine months. I wanted to think of a creative way to tell another one of my dear friends, Mindy, as well. Mainly because Mindy has been asking and/or hoping I would get pregnant for some time now. Every time I would pin anything baby related on Pinterest, I'd get a message from her asking if I had something to tell her. She was so excited for this point to come in mine and Jon's life that I knew a normal "Guess what? I'm pregnant!" announcement wouldn't do. But I wanted to catch her off guard, as I think those are the best surprises. Mindy always finds adorable prints and sayings online that she often asks if I can recreate for her home. So I thought I could use that to my advantage. 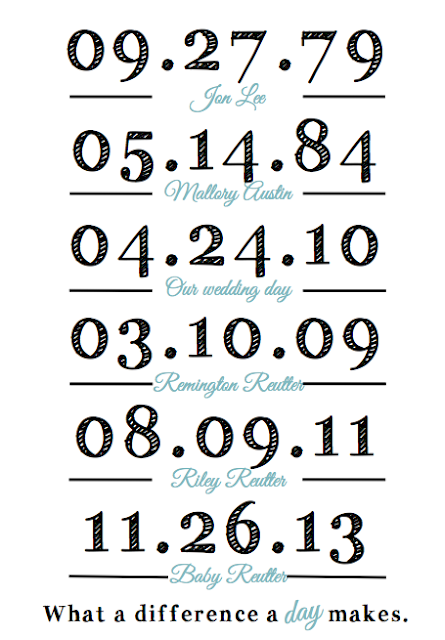 A few months before, I had created a print for her showcasing important dates in the life/marriage of her parents, including their birthdays, wedding day and their children's birthdays. 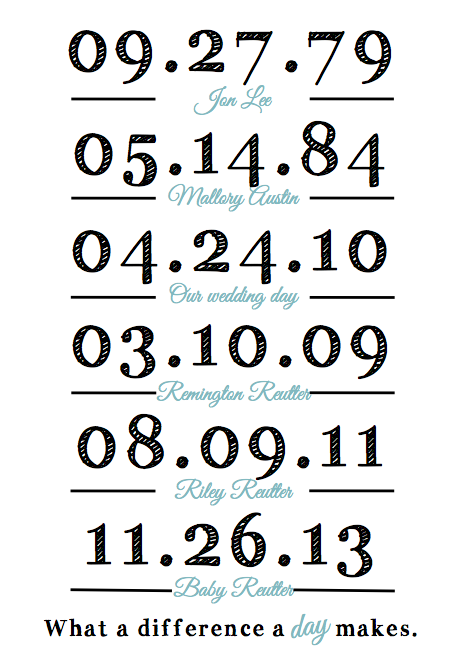 I decided to make one of my own, with the last date listed being the due date of Baby Reutter. I created the print and sent it to her in an email saying something like "I loved the print you had me do so much that I had to make one for our own home." I've edited some of the dates for privacy reasons, but here's the idea. Needless to say, she was surprised and I got an excited phone call shortly after. Babies are such blessings, and I had so fun thinking of how to make these announcements. Now, if only my former creativity would come back to me so I could finish hammering out the details for the baby's nursery... More on that coming soon!